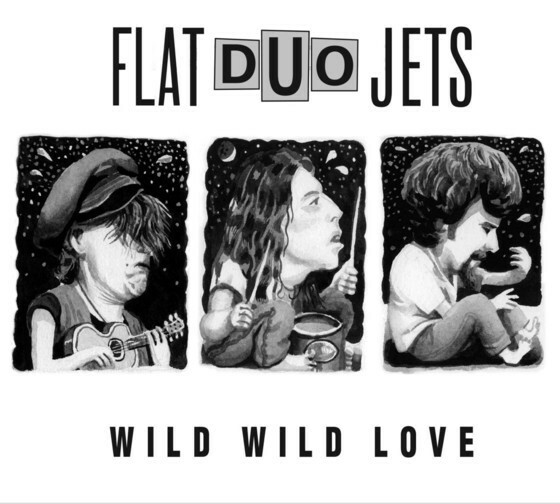 Previously only a Record Store Day release, Daniel 13 is releasing the Flat Duo Jets' Wild Wild Love on Friday, October 20th. Wild Wild Love cobbles together the Flat Duo Jets album, their debut album In Stereo, and a slew of outtakes. We caught up with Flat Duo Jets frontman Dexter Romweber to discuss Wild Wild Love and more. The re-release was the record company's idea. To celebrate the album's release, they included a 78-page booklet peppered with concert fliers from the band's early years, photos of the band, and a lengthy history of the band compiled and written by News & Observer music critic David Menconi. The photos and fliers came from Dex's sister Martha, the family archivist who Romweber claims has always had the ability to know when to stick something aside for later. In the liner notes, Menconi said of the Jets, "Their biggest fans have always been other musicians." While Dex wasn't really sure what prompted Menconi to write those words, he surmised it might have something to do with his vast, encyclopedic knowledge of music. We asked Romweber where he found all these bands and songs from yesteryear that everyone had either forgotten about or never knew existed in the first place. He said he was constantly having friends turn him onto old bands growing up and that a record store in Chapel Hill started stocking rockabilly albums and surf compilations in the '80s. A cover of Santo & Johnny's "Sleepwalk" is one a baker's dozen of outtakes on the Wild Wild Love compilation. While Romweber didn't remember recording the tune or even what it sounds like (note to Daniel 13: send the man a copy of his album! ), he was drawn to the original's guitars. And while Wild Wild Love was a Record Store Day success and hopefully the catalog CD version follows suit, there are currently no plans to re-release any of the Jets' other albums. Everyone who has seen the documentary Athens, GA: Inside/Out knows the Flat Duo Jets pretty much stole the show. The band's frantic live performance interspersed with Romweber and Crash's charismatic interview won them more than a few fans. When we asked if there was any backlash from any Athens bands about the Jets' appearance in the documentary due to the Jets only arriving in town a few months before filming, Romweber said there might have been a few words from a guy in Pylon, but really, most of the bands weren't from Athens anyway, so he didn't see the big deal. Growing up, Romweber lived in The Mausoleum, a shack that stood behind the family home that he decorated. It soon became a place for his bands to practice and for friends to hang. MTV even did a piece on it in 1985. Romweber had no idea how MTV had even heard of The Mausoleum, but he figured someone around town clued them in on it while they were in town recording a segment on the Chapel Hill music scene. Sadly, The Mausoleum burned down. Romweber likened it to the destruction of his innocence due to the fact that it was once a place for he and friends to hang out, play music, and do drugs. After The Mausoleum burned down, he and his friends slowly drifted apart, partly due to the fact that they no longer had that central place but also due to the fact they were having to move onto the next phases of their lives with increased responsibilities. In 1990, the Flat Duo Jets appeared on Late Night with David Letterman, thanks in part from their manager catching Paul Shaffer taking food from Fetchin' Bones' deli tray. Dex remembers being nervous that night but managed to knock everyone's socks off. While most people would go into a Late Night with David Letterman appearance thinking he would be a career-changing moment, Romweber didn't really look at it that way. It was just another event in a serious of events that had been happening to Romweber at the time. He was young and enjoying the moment and not really thinking about what these events could lead to. In 2016 and 2017, Romweber toured with the Flat Duo Jets, but it was in name only. Dex and Crash had lined up a Spain tour in 2016. However, the promoters wanted the band to tour as Flat Duo Jets, figuring it would get more folks to the clubs. While Romweber thought it was silly, he agreed to it, but the tour was far from a success. When Dex got back to the States, he found that he had made a little less than $700 from the tour. This year, promoters wanted Dex to open for Reverend Horton Heat, but once again, only if he toured under the Flat Duo Jets name. Currently, Romweber has been playing some solo shows and has a few dates lined up as the Flat Duo Jets. He'd love to be working on a new album, but hasn't heard anything from Bloodshot Records since the release of his 2016 album Carrboro. You can order a copy of Wild Wild Love here.